American pitcher in Major League Baseball. He is probably best known for his involvement in the 1919 World Series fix, known as the Black Sox scandal. 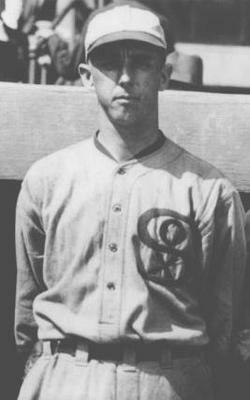 Despite posting a career ERA (3.13) slightly higher than the league average (3.10), Lefty Williams notched the highest winning percentage in White Sox history during his five years with the club, winning 81 games against just 44 losses. The 5'9", 160-pound left-hander possessed an average fastball and a curve he could effectively locate in the strike zone. A fly ball pitcher, he used Chicago's excellent outfield defense to full advantage, and rode Chicago's stellar offense to back-to-back 20-win seasons in 1919 and 1920. No more than an average starting pitcher, Williams achieved greater fame than his skills warranted through his involvement in the 1919 Black Sox scandal. He threw three games in the Series, becoming the first pitcher in baseball history--and still the only starting pitcher--to lose three contests in a single Fall Classic. Claude Preston Williams was born in Aurora, Missouri on March 9, 1893, the son of William and Mary Williams. While still a child, his parents moved 30 miles to Springfield, Missouri where Williams began playing baseball. As a left-hander, Williams immediately took to pitching. He mastered the curveball at a young age, using it to fool other kids in games played in vacant lots. Williams' mastery of the curve brought him local notoriety and he soon began playing with the Springfield team of the semipro Missouri-Kansas League. In 1912 he joined Morristown (Tennessee) of the Appalachian League, posting an 18-11 record and league-leading 224 strikeouts. The following year joined the Nashville Volunteers of the Southern Association, and once again won 18 games. Near the end of the season, the Detroit Tigers purchased his contract. He made four starts for the Tigers at the end of the 1913 season, going 1-3 with a 4.97 ERA. The young left-hander made one more start for the Tigers in May, 1914, allowing five unearned runs in one inning. Sent to Sacramento of the Pacific Coast League, Williams went 13-20 with a 2.05 ERA in 276 innings of work. Williams spent the 1915 season with the Salt Lake City Bees of the PCL, and finally started coming into his own as a pitcher. In 418 2/3 innings of work, Williams struck out a league-high 294 batters, en route to 33 victories, also tops in the league. After the season, the Chicago White Sox purchased his contract. Despite his diminutive size, Williams seems to have experienced little difficulty handling heavy workloads, even though he relied on a pitch (the curveball) that was taxing on the arm. Part of the reason for this may have been his unusual physical stature: despite his small size, Williams had a robust upper body--his broad shoulders and neck earned him the nickname "the biggest and littlest man in baseball." Williams was an immediate success with the White Sox, showing excellent command of his curveball as he established himself as a stalwart of the Sox pitching staff. He started more games than any other pitcher for the White Sox in 1916, compiling a 13-7 record with 138 strikeouts in 224 1/3 innings pitched. But he was not overpowering, either. For the season Williams compiled a 2.89 ERA, highest on the team and slightly higher than the league average. In order to be successful, the slender lefty relied on good run support from a Chicago offense which included Eddie Collins, Happy Felsch and Joe Jackson, and stellar defense, especially from his outfielders, as Williams used his curve to coax hitters into sending harmless fly balls into the vast outfield of Chicago's Comiskey Park. "Outside of Eddie Plank, no left-hander in the American League makes as close a study of his batters or pitches more intelligently to them than Williams," Eddie Collins observed after the lefty's inaugural season with the White Sox. In June 1916, Williams married Lyria Wilson, a manicurist he had met in Salt Lake City the previous summer. In 1917 Williams became even more dependent on his defense and run support, as he struck out just 85 batters in 230 innings and posted a sub-par 2.97 ERA. Nonetheless, he established a club record by winning nine games in a row to start the season, before tailing off to finish the year with a solid 17-8 ledger for the White Sox, who won a franchise record 100 games. Williams's late-season struggles relegated him to the bullpen for the World Series, and he appeared in only one game in relief in Chicago's six-game victory over the New York Giants. Despite the immense talent of this squad, the members of the team did not get along well. Differences in geographic roots, education and salaries created rifts among many of the White Sox players. On a team filled with strife, the soft-spoken, often morose Williams was nonetheless able to befriend a teammate. Williams roomed with Joe Jackson, a South Carolina native, on the road and the two players and their wives often spent time together. Their marital status inadvertently created conflict with Comiskey as the United States involvement in World War I grew. Jackson opted to work and play baseball in the Navy shipyards instead of making himself eligible for the military draft. In June, Williams and catcher Byrd Lynn, also married, opted to follow Jackson into the shipyards rather than risk being sent overseas away from their spouses. Initially Comiskey was irate with the trio, stating that none were "fit to play on my club". He deemed their actions cowardly and unpatriotic and the players were temporarily blacklisted as were other players throughout the league who pursued a similar course. But at the end of the war and following a sixth place finish, Comiskey changed his mind and added the players to the White Sox roster. Comiskey's change of heart turned out to be fortuitous. With a lineup essentially identical to the 1917 White Sox, Chicago marched to the American League pennant in 1919. Williams combined with pitcher Eddie Cicotte to provide a dynamic pitching tandem, Williams contributing 23 wins over the course of the season to go with Cicotte's 29. For the only time in a full season, Williams posted an ERA better than the league average, and his strikeout rate also climbed, as he fanned 125 batters in 297 innings of work. Considered an asset in the club's quest to win a second World Series in three years, Williams instead joined six of his teammates in accepting money from gamblers to throw the Series. With a salary that did not exceed $500 per month, Williams was one of the lowest paid players on the club, and particularly susceptible to the promise of a $10,000 payoff. He proved instrumental in the success of the fix, agreeing to participate before Jackson and Felsch. It was also Williams who personally delivered a payment of $5,000 to Jackson after Game 4 of the Series. Of course, his greatest contribution to the scheme came on the field, where he artfully threw his first two starts against the Cincinnati Reds. In Game 2, he coasted through the first three innings before allowing three walks, a single and a triple in the fourth inning to give Cincinnati three runs, which proved to be all they needed in a 4-2 victory. In his next start in Game 5, Williams actually held the Reds hitless through the first four innings, then again eased up, allowing four runs in the sixth frame to provide the Reds with a lead they would not relinquish. With Chicago trailing four games to three in the best-of-nine series, Williams took the mound for Game 8. He wasted no time in throwing the contest, surrendering four runs in the first inning before Chicago manager Kid Gleason removed him from the game. Williams had faced just five batters, retiring only one. Chicago went on to lose the game 10-5. In the end, Williams received $5,000 for his role in the fix. In Eight Men Out, author Eliot Asinof writes that Williams had planned to try to win the eighth game until receiving a visit from a gambler's henchman named Harry F., who threatened to harm Williams' wife unless Williams lost the game in the first inning. However, Asinof later admitted fabricating this story as a means of thwarting potential plagiarizers. The story, which was also a pivotal scene in director John Sayles' film version of the book, is fictional. Williams was again a big winner for the White Sox in 1920, notching 22 victories against 14 defeats for the season, despite an unimpressive 3.91 ERA. Always a fly ball pitcher, the league-wide increase in home runs that year hit Williams particularly hard, as he surrendered 15 round-trippers for the season, the most in the majors, including three of Babe Ruth's 54 home runs. Like his teammates who were involved in the 1919 fix, Williams's season came to an end on September 27, following gambler Billy Maharg's revelation of the fix to a Philadelphia newspaper. Soon afterward, Cicotte became the first player to confess to the Cook County grand jury, and Williams himself confessed the following day. After his 1921 acquittal in trial and his banishment from the game, Williams played on various barnstorming teams with his disgraced teammates, eventually moving to Arizona where he played baseball in the "outlaw" Copper League in 1926 and 1927. Williams and Lyria continued west to Laguna Beach, California, where Lefty started a nursery and landscaping business, and like many of the other banned players, maintained his silence about the affair. Williams and his wife--the couple had no children--remained in Laguna Beach until Williams passed away at age 66 on November 4, 1959. He was buried in an unmarked grave in Melrose Abbey Memorial Park in Anaheim, California. Looking for more information about Claude Preston Williams?